There seemed to be an electricity in the air this morning at camp with it being the last day of full activities. As the guys fought the urge to sleep more, they were greeted with the sight of French Toast and Sausage for breakfast. After a stupendous and especially loud morning yell, the boys headed to Chapel where they sang worship songs and listened to a counselor’s story about the time he went on a climbing trip here at camp and got stuck on a rock wall only to helped by the leader of his trip. After Chapel, the boys competed one last time in cabin cleanup for the session. Today’s cleanup was especially important due to it being the final grade that would be averaged into the race for the Golden Plunger! Some boys took advantage of having one last ride on the Mountain Biking pump track. Henry S., David S., Jack W, and Winston H. absolutely shredded the course!!! Other guys went on some final trips to beautiful hiking and swimming spots found here in Black Mountain and Asheville. The ENTIRE cabin of Tomahawk took a canoeing trip to Lake James, where they were able to all be in one extra-large canoe named the “Voyager”. A few boys including Sam H. were able to venture to Catawba falls where they hiked to a waterfall and were able to swim in it. Lunch was greeted with a warm welcome, PIZZA with s’more pockets for desert. After lunch everyone enjoyed rest time, but more importantly trading post and free time. The boys spent the vast majority of free time playing in a multitude of tournaments all around camp. Some of these included a fencing tournament hosted by Patrick P. and Isaac L. and a Paintball tournament that was one by Sean G. who earned his gold in doing so. In the afternoon, boys spent time on the lake at both swimming and kayaking. 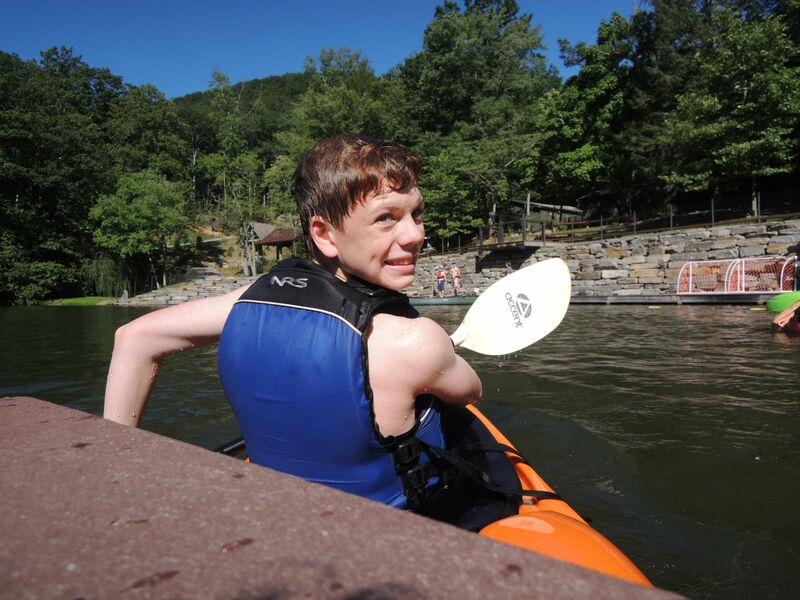 In Kayaking, Hunter S. and Alex D. worked hard on learning new paddle strokes that will help them on future river trips. At swimming, the boys cooled off with a free swim and took full advantage of the diving boards and the blob. From crazy dive contests, to giant blob jumps, everyone had a great time in Lake Doris. Other boys spent time up on Spencer’s green climbing the upper tower. At dinner, the guys were treated with pulled pork sandwiches and fried okra. After dinner, the sultan on fun put on the helmet and the boys screamed and cheered in anticipation of finding out what the evening activity was. It was Little Chief!!! A great celebration of growth for the boys took place at the council ring as the young boys earned promotions in the little chief system from marks earned through activity bars and commendations from fellow campers and counselors. JB G. and Matthew J. earned the rank of Little Chief tonight, which is the highest honor on the LC system. After a standing ovation for the great young men, it was revealed that everyone would be playing commando, a giant water balloon extravaganza on spencer’s green. Tonight, the boys will wind down and spend some quality time with their cabin mates, remembering the amazing times they shared and memories they created here at Camp this session. Geometry Breakfast WednesdayWhat is Little Chief?